This individually built detached villa offers approximately 2800 sqft of luxuriously finished and highly flexible accommodation. A selection of traditionally proportioned apartments includes; grand reception hall, cloaks WC, impressive lounge, high specification dining kitchen, separate dining room with French doors to garden and utility room with access to integral garage. The first floor provides master bedroom with dressing area and en-suite, guest bedroom with a second en-suite, two further bedrooms and family bathroom with the final two bedrooms and an additional bathroom on the upper level. Features including double glazing and gas central are complemented by beautiful decoration throughout. This elevated position within Dalziel Park ensures open views and substantial garden grounds with extensive parking. 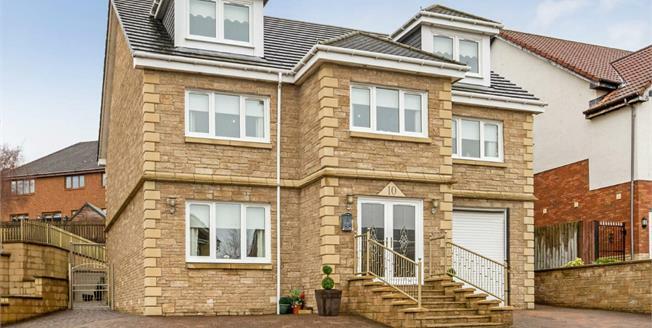 This locally admired development gives excellent access to Motherwell facilities including quality schooling, shopping, varied leisure pursuits including adjacent golf course and train station.